This is a developing story and was updated April 7 at 12:55 p.m.
"The Senate today approved Judge Neil Gorsuch as a new member of the United States Supreme Court the way the Senate has always done throughout its 230 year history—we did it by majority vote. Judge Gorsuch is enormously well-qualified and has said that he would decide cases based upon the law rather than his personal point of view. He will be a superior new member of the United States Supreme Court." "Our next Supreme Court justice will have a lasting impact on the direction of our country, and as I said on February 2 after meeting with Judge Gorsuch in my Capitol Hill office, I have full confidence in his dedication to upholding the Constitution and applying the rule of law in a fair an independent manner," said Corker. "I am pleased President Trump nominated such a well-respected and qualified individual, and I was proud to cast a vote to confirm Judge Gorsuch." — U.S. Sen. Bob Corker, R-Tenn.
UPDATE: The Senate confirmed Neil Gorsuch to become the newest associate justice on the Supreme Court Friday, elevating Donald Trump's nominee following a corrosive partisan confrontation that could have lasting impacts for the Senate and the court. Gorsuch won support from 51 of the chambers' Republicans as well as three moderate Democrats up for re-election in states Trump won last fall: Joe Manchin of West Virginia, Heidi Heitkamp of North Dakota and Joe Donnelly of Indiana. GOP Sen. Johnny Isakson of Georgia did not vote. The outcome was a major win for Trump, his biggest congressional victory to date, as well as for Senate Majority Leader Mitch McConnell, R-Ky., who kept Scalia's seat open after the justice's death in February 2016. McConnell refused to hold hearings for President Barack Obama's nominee. After he is sworn in, Gorsuch will restore the court's conservative voting majority that existed before Scalia's death. "He's an exceptional choice," McConnell said. "I believe it will make this body a more partisan place," Senate Minority Leader Chuck Schumer, D-N.Y., said on the Senate floor ahead of the vote. "It will make the cooling saucer of the Senate considerably hotter, and I believe it will make the Supreme Court a more partisan place." Gorsuch is expected to be sworn in within days, in time to hear the final cases of the term. He was nominated by Trump shortly after the January inauguration. The Senate change, affecting how many votes a nominee needs to advance to a final confirmation vote, will apply to all future Supreme Court candidates as well. Trump himself predicted to reporters aboard Air Force One that "there could be as many as four" Supreme Court vacancies for him to fill during his administration. 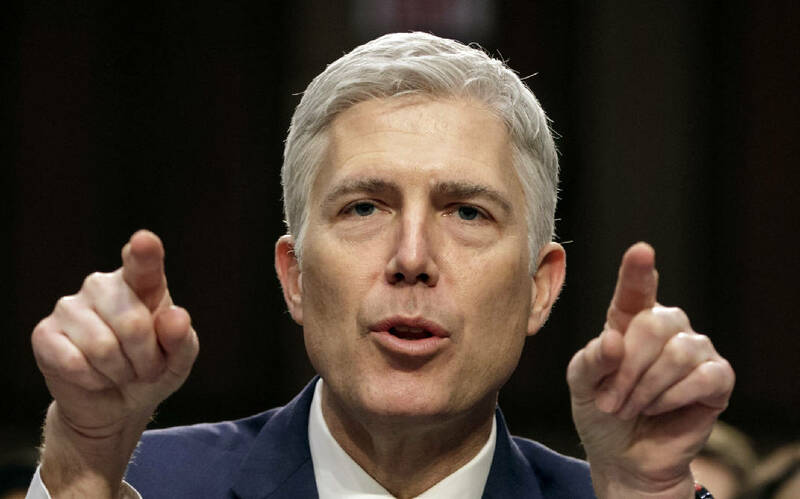 WASHINGTON — President Donald Trump's Supreme Court nominee, Neil Gorsuch, headed for confirmation on Friday after Republicans tore up the Senate's voting rules to allow him to ascend to the high court over furious Democratic objections. "He's an exceptional choice, and I'm very much looking forward to confirming him today," Senate Majority Leader Mitch McConnell, R-Ky., said ahead of the vote. "Of course, I wish that important aspects of this process had played out differently." Vice President Mike Pence was expected to preside as all 52 Republicans and three moderate Democrats from states that Trump won — Joe Manchin of West Virginia, Heidi Heitkamp of North Dakota and Joe Donnelly of Indiana — cast their votes for the Supreme Court nominee. Sen. John McCain of Arizona, a senior Republican, warned of the implications of lowering the 60-vote threshold for Supreme Court nominees, thereby eliminating any role for the minority party in ratifying the selection. "I am very concerned about the future, which will then, with only a 51-vote majority required, lead to polarization of the nominees as far as their philosophies are concerned, when the majority does not have to consider the concerns and the votes of the minority," McCain said. McCain himself voted to lower the threshold. The final confirmation vote on Gorsuch was scheduled midday Friday. He is expected to be sworn in within days, in time to hear the final cases of the term. He was nominated by Trump shortly after the January inauguration. In 2005, with the Senate under GOP control, Republicans prepared to utilize the "nuclear option" to remove the filibuster for lower-court nominees. A bipartisan deal at the time headed off that change. But then in 2013, with Democrats in charge and Republicans blocking President Barack Obama's nominees, the Democrats did take the step, removing the filibuster for all presidential appointments except the Supreme Court. But Democrats were unable to pull back from the brink, partly because they remain livid over McConnell's decision last year to block Obama's Supreme Court nominee, Judge Merrick Garland, who was denied even a hearing after the death of Justice Antonin Scalia in February 2016. Instead McConnell kept Scalia's seat open, a calculation that is now paying off for Republicans and Trump.